Check out the latest Hipster ranking. Hipsters appreciate more than rocking flannel and chugging Pabst Blue Ribbon. They also appreciate skinny jeans, bands you never heard of and, above all, a place of higher learning where they’re able to find like-minded individuals. Our list of top 10 hipster colleges will not only show you where students go to be ironic, but where they’re encouraged to think and live outside of the box. Ever heard of it? At almost 200 years old, it’s one of the oldest art schools in the country—so don’t try and tell your friends you knew about it before it got popular. 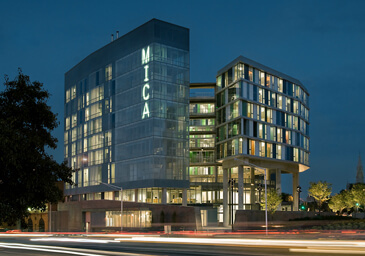 MICA, located in the middle of Baltimore, beats as the artistic heart in the hipster chest of charm city. In 2013, Thrillist named Baltimore in its top ten list of America’s most hipster cities. Students at MICA also have access to Fell’s Point, a neighborhood known for its cobblestone streets and eclectic mix of bars and shopping suited for hipsters of all ages. Hip students come to experience a world-class education in the arts, and maybe pick up a minor in creative writing while they’re at it—only in Baltimore, where even the beer is bohemian. Complement your hipster look with your favorite throwback books.